Today's nails were inspired by events that took place on March 3, 2010. This is a dramatic representation of actual events. I went to the LAPD Homicide/Crime Evidence Exhibit last night here in Las Vegas. There was evidence from heinous crimes like the Manson Murders (The Manson Murder Vehicle, ropes used to tie up Sharon Tate, etc), Black Dahlia, OJ Simpson (Gloves, hat, etc), and a number of other murders and assaults. It was fascinating, but truly disturbing/sickening to be mere inches from instruments of terror. One of the more disturbing things was seeing the footage of the Manson women, they were so enthralled with him, saying so many wonderful things about him, etc. I used Diamond Cosmetics #319 Lemon Yellow Zest as a base, with Zoya Dovima painted over for the asphalt, and Zoya Raven for the lettering. For the chalk outline, I used OPI Alpine Snow Matte. its really cool and junk.but, i dont like the story behinde it... sorry! I don't think it's too disturbing. I think the exhibit would be scary, for sure, but interesting. It's always sad to be reminded of how sick people in this world are . . . Anyway, you did a good job on the nails. I love how they continue on from nail to nail, complete with partial letters! You should do nails in honor of Alice in Wonderland coming out this weekend. There are so many things you could experiment with! Yeah, and have you ever seen one of Manson's parole hearings? They are chilling to the MAX. He remains one of the creepiest weasels ever to clutter this earth. 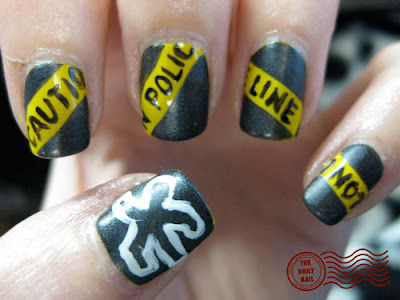 Great nails, btw. I love the crime scene tape! Plus, the Dovima makes GREAT asphalt. Vincent Longo Cosmetics Sale on Hautelook! Luminesse Air sale on Hautelook! Konad USA Puts Stop to Coupon codes! Check Out My New Weave!